Radiofarda – Some 95 members of Iran’s parliament (Majles), including 22 prominent reformists, have tabled a motion on Sunday December 2 that would tighten Iranian government’s grip on domestic and foreign messaging services. The reformists have been harshly criticized on social media for the move. The bill is to be annexed to article 67 of Iran’s sixth development plan that is generally about what Iran calls the National Information Network, an intranet that would limit Iranians’ access to the global Internet network. 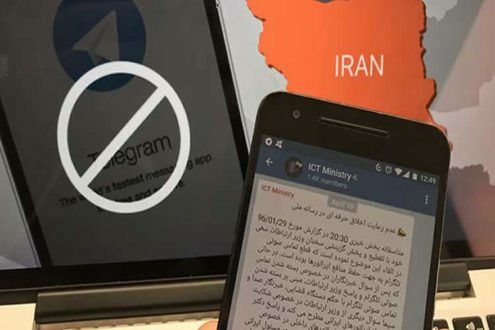 The Joint Staff of Iranian Armed Forces is also following a plan about controlling cyberspace by “virtual border guards.” The plan is believed to bring about a situation in which parallel organizations will attempt to control Iranians’ access and use of the Internet. Attempts to control the messaging services started in January 2017 and finally resulted in a document called “Policies and Measures Regarding Social Messaging Services,” a directive drawn by the Supreme Council of Cyberspace, a body whose ratifications are endorsed by Supreme Leader Ayatollah Khamenei. This committee will have all the powers previously exercised by the Counter-Cyber Crimes Committee, the National Center for Cyberspace and the Prosecutor’s Office and can order the Judiciary to punish those who violate its ratifications. Still the most controversial part of the plan is putting the Digital Border Guards in charge of cyberspace. This is a body to be established by the Armed Forces Joint Staff upon Khamenei’s approval. The plan adds an additional layer of control over cyberspace. Gholamreza Jalali, Iran’s Civil Defence Chief, said in October that a Cyber Defense Headquarters is going to be set up in order to guard the country’s virtual borders. Khamenei has already approved the establishment of this headquarters in 2013. The headquarters’ commander will be appointed by Khamenei once Jalali sets it up. The bill suggested by the MPs requires that cell phone importers pre-install homegrown messaging applications on new phones by default, and further suggests linking the messengers to the country’s banking system to make them more useful. Pragmatist President Hassan Rouhani who won his election thanks to campaigning on Telegram failed to protect it against his conservative rivals. His government’s attempt to curb Internet-based activism included charging twice as much for data usage on foreign messengers and applications compared to the rate for data consumption on homegrown messaging services and websites.